Why You Shouldn't Ever "Dress Your Age"
There is absolutely no truth in the phrase "dress your age" and I will prove it to you. I know, I know. You work in an office, you can't wear Lisa Frank leggings and platform shoes, I KNOW. But hear me out on this one. First, a little story about me. I spent my entire childhood in uniforms. Catholic school from age 3 to 17 with the prerequisite plaid skirts and itchy cardigans made me really lazy in style choices. I truly had no opinions on what to wear until I was in my late teens. But when I realized that college was coming and I could dress however I pleased, a whole world was opened to me about expressing myself in the way that blackwatch plaid never could. That was, of course, a very long time ago. But even now at age 39, the phrase "dress your age" makes me mad. And it is my opinion that it should make you mad too. Why? Why should we assume a uniform due to our age? What if we threw caution to the wind and dressed exactly how we want to? What would happen? Would we not be taken seriously? Perhaps. Perhaps there are, in fact, reasons to "dress your age" in life, but that's not your *entire* life. You don't live in a boardroom. If you do, I'll send a St. Bernard with some Russian Red lipstick and glittery heels, because you need HELP. No, I'm not talking about taking a meeting in while wearing a feather boa. Let's not go cuckoo here. But what if, just WHAT IF, you went to the movies wearing a vintage peasant blouse instead of a plain t-shirt? What if you went to a summer barbecue wearing a fabulous yet comfortable pair of sandals instead of $2.99 flip flops from Target? And what if the opposite is true, and you're simply dying to wear Target head to toe but feel the pressure to dress up even though you're just taking the kids to the movies? Forget dressing your age. Forget everything you've been told to do. Let me tell you about one of my heroes instead. 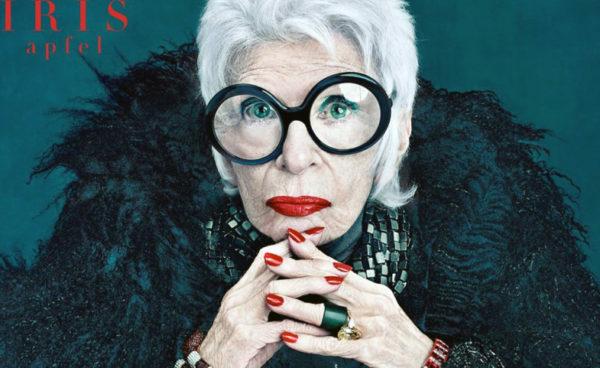 This is Iris Apfel. She's a fashion icon, business woman, and interior designer. And she doesn't dress her age, which is 95. She loves costume jewelry, huge glasses, and being generally fabulous. And I try to give her recognition every day. Even when I'm wearing my work uniform (and face it, whether you wear a name tag or a business suit, we all wear uniforms to work) I add just a *little something Apfel* to make it fantastic. And even if you cling to your out of work uniform, even if you live in the same type of outfit all the time, which there is exactly nothing wrong with, just think before you run out the door, *APFEL* and grab some earrings, or a bracelet, or a statement necklace, and do it for Iris Apfel. And if you don't have time for even that? If you still carry your Apfel on the inside, imagine 95 year old Iris coming through you in your stance, in your attitude, in you inner Apfel. And that's more fabulous than any piece of jewelry. Starship Pediatric Dentistry is out of this world!